Gilardi & Umberto Mascheroni Built Some Great Bikes Together, but Info About the Pair Is Hard to Come by. Here’s What I’ve Learned. As I did my research for To the Max, I came across a wide variety of Torker bicycles, some produced and sold by Torker, some individually built to the personal spec of Torker Factory Team riders and others offered by Torker Distributors. What follows is a list of those bikes and their specifications as best as I was able to determine. I plan to add a few others in the near future. Stickers: Red or yellow, Johnson Engineering MX headbadge, lightning-bolt logo down tube stickers and either two “Chrome Moly” stickers or nothing on the seat tube. Retail Price: $210 on the West Coast; $220 on the East Coast. Geometry and other facts: The L.P. had an 18.5-inch top tube, dual head tube gussets, a round brake bridge, a relaxed 64-degree seat tube angle and was available in chrome, red, blue, black and white. The July 1978 Torker Dealer Catalog, which was never distributed, shows a gold option and no white option. No gold Torkers are known to exist. Serial numbers for Torker frames made through 1978 were on the bottom bracket shell. It is assumed the serial numbers ended with “L,” for L.P.
Stickers: Red or yellow MX headbadge (unlikely Johnson Engineering version), lightning-bolt logo down tube stickers and two “Chrome Moly” stickers on the seat tube. Forks have lightning-bolt logo. The logo on the new vinyl pads is in the original Torker logo font—the lightning bolt logo—but minus the lightning bolt. Retail Price: Unknown, but the wholesale price was $185. Stickers: Red MX headbadge new non-lightning bolt down tube stickers, one 4130 Chomemoly seat tube sticker. Fork stickers are new non-lightning bolt logo. Retail Price: $288.75, jumped to $318.75 in 1980. Frame: Torker 4130 chromoly or mild-steel L.P.
Geometry and other facts: Available in all the Torker colors with contrasting anodized parts (gold, blue). Stickers: Red MX headbadge new non-lightning bolt down tube stickers, one 4130 Chomemoly seat tube sticker on chromoly frame and none on mild-steel frame. Fork stickers are new non-lightning bolt logo. Retail Price: $209.75 in mild-steel; $239.75 in chromoly. Geometry and other facts: Yellow Torker pads. Everything Bicycles designed the parts packages for its bike dealers and sold them disassembled and shipped them in two boxes, one for the frame and fork and one for the parts. Geometry and other facts: Blue Torker pads. Everything Bicycles designed the parts packages for its bike dealers and sold them disassembled and shipped them in two boxes, one for the frame and fork and one for the parts. Geometry and other facts: The E.K. Replica has the same geometry as the L.P. The only difference is a European bottom bracket shell. Geometry and other facts: Test bike came with Suntour hubs because the stock Shimano hubs were back ordered. Bike got positive reviews, but the rear drop out was poorly butted to the seat stay. After the pedals were destroyed, the testers put on KKT Lightnings. Geometry and other facts: The new mini frame, like the new cruiser, lacked head tube gussets. It had a 17.5-inch top tube, a 7/8-inch O.D. down tube, a European bottom bracket shell and used 13/16-inch O.D. seatposts. Geometry and other facts: Torker vinyl pads. The frame lacked gussets and was built with larger-diameter 5/8-inch tubing (20-inch frames have ½-inch tubing) for the top tube/seat stays and the chain stays. The rest of the tubes were beefed up a ¼ inch to 1¼ inches. The wall thicknesses, were 30 to 40 percent thinner. Miller’s bike weighed 29 pounds, 14 ounces. Geometry and other facts: Basically a Torker L.P. Long (the 280 is the standard size frame) sold only as a complete bike. Stickers: Standard with the short-lived vertical headbadge. End of an Era To be honest, it has been difficult from this point on to track the Torker product line. Torker seems to have developed a split personality. It was developing high-end products for its racers, but was pushing its price-point bikes on the general public. Close inspection of race photos featuring Torker Factory riders Kelly McDougall and Dave Marrietti show them riding the new Pro X frames, but Torker’s advertising was focused on the price-point 280. The ads were again high-production quality, full-color, full-page ads, but they featured arguably cheesy themes. The Pro X, a longer frame set with a 19.5-inch top tube, made its debut in 1983 and was the frame ridden by racers such as Tommy Brackens, McDougall and Richie Anderson, but it got relatively little media coverage. Torker also rarely, if ever, promoted the frame in advertising, opting instead to put its marketing dollars into promoting the 280. The frames got a variety of new features, some of them technological in character, others simply cosmetic. The Pro X, for example had a machined head tube and bottom bracket shell. The design innovation improved strength and helped prevent flaring. Torker built the Pro X frames with Ishiwata butted tubing and replaced the fish-scale gussets with gussets under the down tube similar to those found on the Haro frames and Redline Prolines as early as 1978. The Pro X serial numbers ended with the letter “P” and looked like this, TLL 0125 P.
In August 1983, the 280 and 280X saw the first change to the fish-scale head tube gussets since 1978. Vertically oriented elliptical cutouts in the two gusset plates replaced the old round holes. Torker began to alter its frame graphics in late-1982 and introduced a new oval headbadge late in the year. But this was short lived and was replaced by a “T” headbadge that was part of a totally redesigned graphic look used on all Torker frames from 1983 on. Getting a handle on just what Torker offered in its 1984 line is not easy. Based on what can be seen in photos of racers that year, the line appears to have grown and evolved. But few ads or marketing materials have surfaced that clearly outline what the company offered. Photos of a small (You might call it a mini.) bike under team racer Jason Foxe show a frame that, like the earlier mini, lacks head tube gussets, but unlike any Torker before it, seems to have a single top tube and an integrated seat clamp. Another bike recently surfaced in a collection that shares some of the characteristics found on Foxe’s frame, but that definitely has a new style double top tube. Instead of two tubes diverging from the head tube and connecting to a plate at the seat tube, the frame’s two tubes run parallel to each other until they wrap around the seat tube and become seat stays. No gussets or plates connect the two tubes. Its serial number, TEE 1260 RP, shows that it was made in June 1984. The ending letters, “RP” are interesting in that they are a combination of the “R” used on minis and the “P” used for the Pro X. The frame shares some characteristics of both, but its size—it has an 18.5-inch top tube—puts it in between both frames. The frame also has a 7/8-inch OD down tube and fork legs. The head tube is machined and there is an integrated seat clamp. The sticker set on the frame is the new 1984 version where Torker’s traditional white, black and yellow logo received the addition of a red stroke. Pads and jerseys at this time also got this treatment. The bike appears to have been sold as a complete. Besides the frame and fork, other Torker parts include Junior T Bars (25 inches wide with a 5 1/2” rise), four-bolt stem and Torker-stamped cable clamps. Some Torker frames made during this time had round brake bridges. And it appears that Torkers were available in chrome or white. It was at this time that Haro took its production off shore, leaving a hole in Torker’s fabrication business. “Haro left in 1983 and by early 1984 was importing frames and later complete bikes from Anlun in Taiwan. Our job-shop cash-cow dried up,” said Harold McGruther. John Johnson, however, diagreed. “We didn’t make a lot of money off Haro. Bob was a big help to us in the beginning. He helped a lot with design work,” Johnson said. Yet, despite their close relationship and the fact that Bob Haro was a pioneer in the freestyle movement, Torker made little effort to enter the scene when it was starting to boom. “The Johnson family was extremely slow to embrace the freestyle movement, too, even though their sister company Max leathers sponsored a bunch of freestylers like Mike Buff, Martin Aparijo, Woody Itson, Fred Blood. We built a freestyle prototype for Martin Aparijo in the summer of 1984, but the company filed bankruptcy four months later,” he said. Aparijo’s two prototype frames are now in the possession of friend and fellow freestyler Woody Itson. In the summer of 1984, Steve Johnson put together a top-notch team and went on a media blitz to promote the team and the brand. His push, however, came too late. Super BMX magazine published an article on the new team in the November 1984 issue, but Torker was already headed for bankruptcy. Clint Miller left Torker for Kuwahara in 1983, and was replaced shortly afterward by Tommy Brackens. Mike Miranda joined Team Torker in January 1984, but left in September when the company was unable to pay him. Richie Anderson joined the team in July and left in November when the team was disbanded and Torker filed for bankruptcy. Johns Johnson said Torker’s bankruptcy was the result of more than 10 years of losing money. “Torker was always a non-profit organization. By the time you paid everyone off, there wasn’t much profit left for the family. Doris and I worked for free. He added that he and his family saw the bankruptcy as a necessity. 1972: First organized BMX races take place in Southern California. Pie plates and motorcycle motocross plates and numbers are the standard. 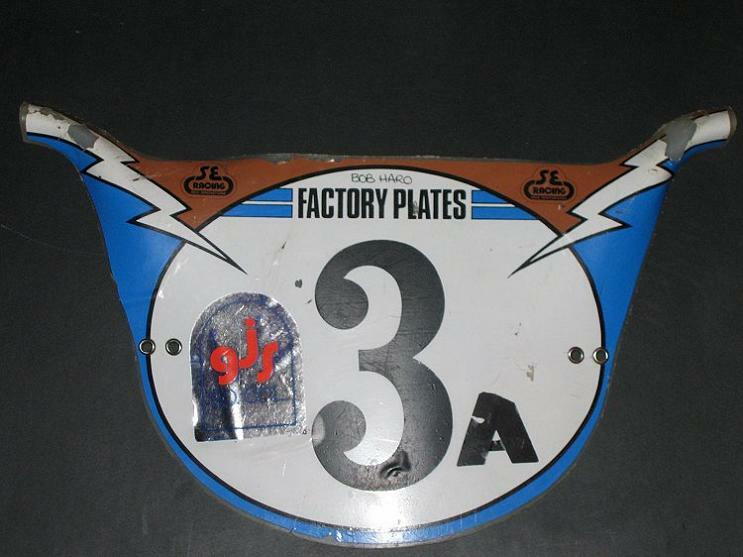 1977: Bob Haro, Dennis Dain and many other young racers start customizing their own plates. Haro begins selling custom-made numbers to local Southern California racers. Later, he starts making custom number plates, using his hand-cut vinyl numbers and Preston Petty number plates. 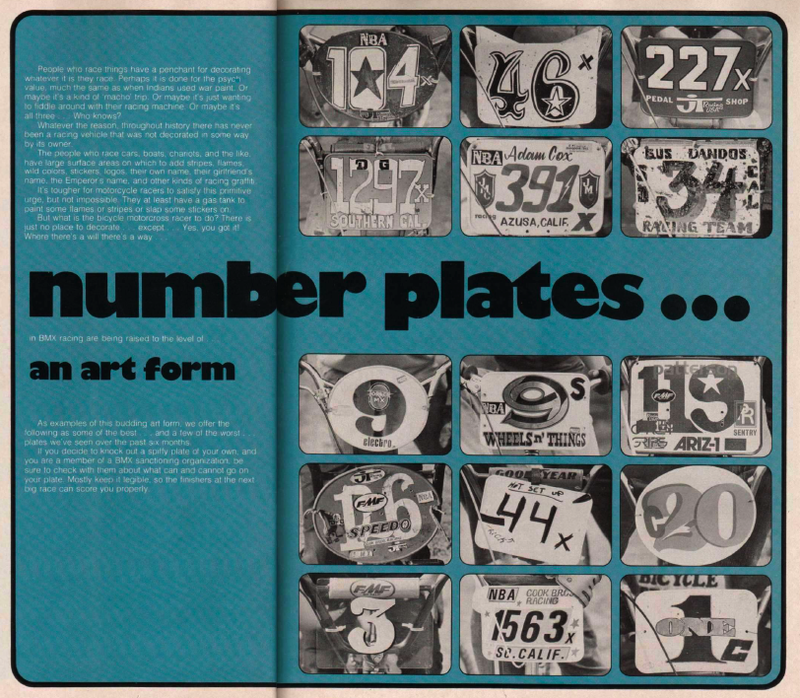 October 1978: Bicycle Motocross Action magazine runs a pictorial titled “Number Plates. . .an Art From.” It features a variety of customized plates. Most are standard oval and square plates with a variety of custom and homemade numbers and lost of stickers. One plate is made from clear acrylic. December 1978: First contoured Haro plate (Pro Plate-type) appears on the cover of Bicycle Motocross Action magazine. Brent Patterson is using a blue, orange and yellow hand-cut vinyl plate. Instead of darts or lightning bolts to cover the seam between the two main colors, Haro used a simple rectangle. This is one of Haro’s earliest hand-molded plates and was like made using Contact paper. January 1979: DG pro rider Clint Miller is on the cover of Bicycle Motocross Action magazine with a custom-made Haro Pro Plate. It’s done in yellow with blue darts. 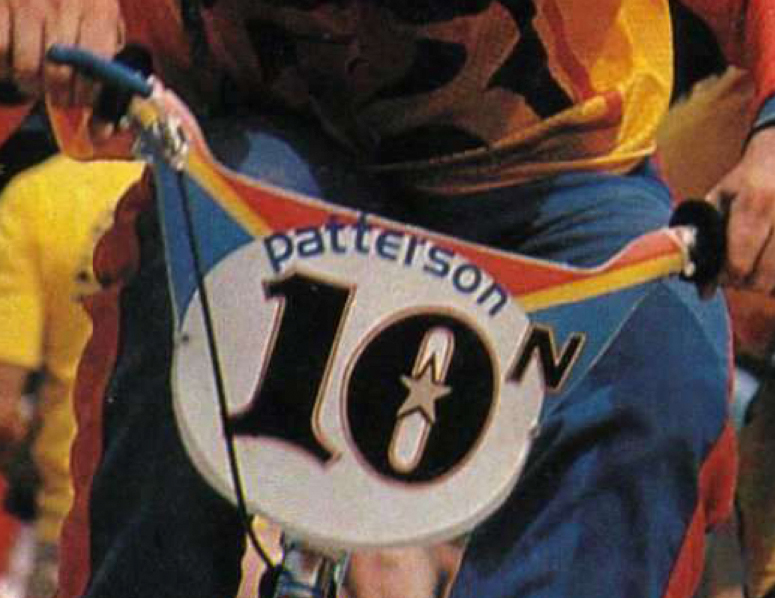 The issue shows that many racers were now running Haro’s plates, among them, Jeff Bottema, Eddy King, David Clinton, Jeff Ruminer, John Crews and Brent Patterson. At this time, Haro was making the plates in his kitchen (and or bedroom). March 1979: Haro runs his first ad in Bicycle Motocross Action magazine. The ad features the Pro Plate Round and Pro Plate Square models. Both are made from hand-molded LDPE with hand-cut vinyl and have lightning bolts. Many of Haro’s lightning bolts at this time were made with chrome vinyl. Each plate had a signature and date on the back. A sampling of number plates made by Bob Haro in 1978. One of Haro's first ads. It shows round and square handmade plates. 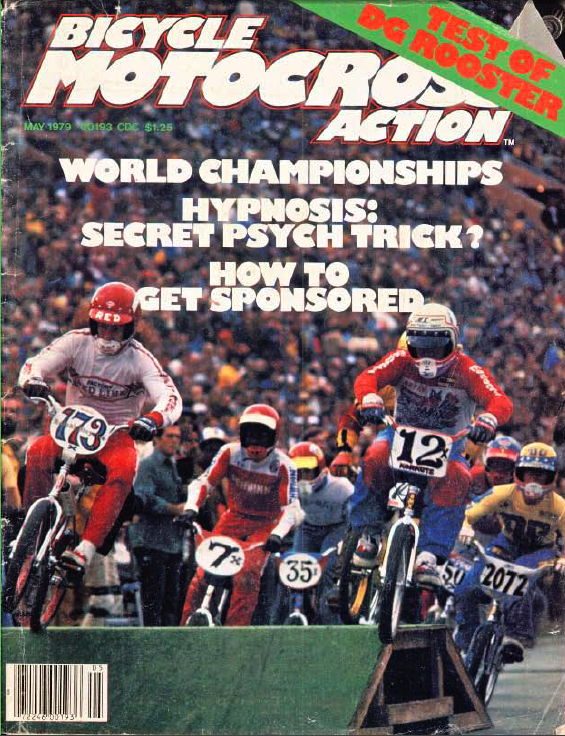 May 1979: Cover of Bicycle Motocross Action magazine shows six pro racers. Of those, five are using Haro Pro Plates. The sixth, Dennis Dain, is running one of his own custom-made plates. Mongoose racer Brain Curnell’s plate is a Pro Plate Square. Also note the DG rider with the 2072 plate. it’s the same plate hat appears in the above ad. The yellow is missing from the top. It was likely made with Contact paper and peeled off soon after the rider started using it. Many photos of riders at this time show them missing one, both or all the colored panels. Stu Thomsen raced with a plain plate for a long time. In the same issue, BMXA featured the Factory Plates in “The Hots” column. The article says Haro was in the process of moving away from making “one-off original. . .individual works of arts” to production plates. He also was discussing distribution deals. An Oakley ad shows Bobby Encinas, Stu Thomsen and Jeff Bottema with custom Haro Factory Plates. Haro also was making custom plates for DG’s new limited-edition California Pro bikes. Haro’s Factory Plate ad in the issue introduced the Werks numbers. It’s around this time that Haro begins renting space in the BMXA building. July 1979: Another cover shot for Haro, this time on Harry Leary’s JMC. Bicycle Motocross Action-branded Haro Pro Plates are available for the first time for $9.95 (Approximately $32 when adjusted for inflation.). They are still made with hand-molded LDPE but the graphics are silk-screened on vinyl instead of hand-cut vinyl. They came in one color—yellow and blue with lightning bolts and the Bicycle Motocross Action logo. Haro Werks numbers are 6 inches tall, solid black and cost 50¢ each. The Haro Factory Plate ad shows a hand-made plate, but the accompanying Haro illustration shows the “Factory Plate” logo for the first time. Cook Brothers plates appear in the magazine for the first time. October 1979: Thruster’s Timmy Judge gets the cover of Bicycle Motocross Action magazine with a custom-made Haro plate. Round and Square silk-screened Factory Plates appear throughout the issue, as well as numerous handmade plates. One Haro illustration shows a Pro Plate with the “Haro” logo on it. Up to this point, Haro was using the Factory Plates logo in his illustrations. The Haro ad is bigger and shows the Round Pro Plate with lightning bolts and the “Haro” logo. Available team colors included Redline, DG, Mongoose and Torker. Werks numbers are available in solid black or white. The original one-piece Haro Handle also appears for the first time. Company is now referred to as Haro Designs instead of Factory Plates. Square Pro Plates are no longer available. November 1979: Bicycle Motocross Action magazine’s annual Buyer’s Guide features BMXA-branded Haro Pro Plates as well as Haro’s Factory Plates with the out-dated Factory Plate logo. March 1980: Neal Enterprise’s Proto Plates appear in Bicycle Motocross Action magazine. They were available in flat, colored plastic with silk-screened graphics. The handlebar “wings” were not formed like Pro Plates. All varieties of Haro-made plates appear in various photos. April 1980: Haro runs half-page black and white ad in Bicycle Motocross Action magazine. June 1980: Curiously, BMXA SE Quadangle test bike has a Proto Plate on it. Until now, all test bikes were equipped with Haro BMXA plates. July 1980: BMXA CYC Panther test bike has a JT Plate. 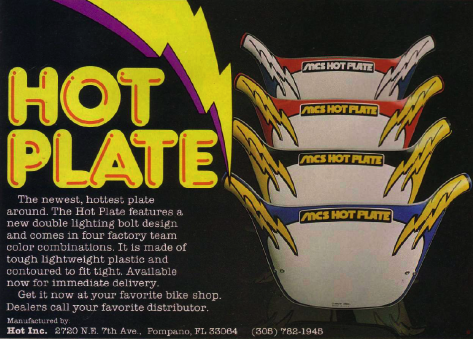 August 1980: MCS Hot Plates appear in ad in Bicycle Motocross Action magazine. Like Pro Plates, the Hot Plates were made from contoured LDPE. BMXA Kuwahara test bike has an MCS Hot Plate on it. November 1980: Haro runs full-page black and white ad. Ad features Pro Plate, two-color Werks numbers and Haro Panel Covers in green and black. BMXA Scorpion test bike has an MCS Hot Plate. February 1981: Haro runs full-color, full-page ad in Bicycle Motocross Action magazine. Zeronine advertises number plates and numbers. They are flat and have multi-colored fire-themed graphics. April 1981: Most of Diamondback Team runs modified Haro plates. The lower color (yellow?) is removed so plates are black and “white” with lightning bolts. Jason Jensen’s bike has custom, one-off, black Haro plate. June 1981: Haro Series One and Wizard plates start showing up in magazines. Both are made from contoured LDPE. Hot Inc. drops “MCS” from Hot Plate logo. RL Osborn is running a yellow and blue Haro Pro Plate with black Haro Panel Cover and his name and BMXA logo in white. July 1981: Uni Plates appear in Bicycle Motocross Action ad. BMXA Trick Team switches from Haro to Wizard Plates. Some pros pictured using Haro Type 2 plates. September 1981: Type 2 and Series One plates now the norm with Pros. Both are made from contoured LDPE and have Velcro fasteners. Coincides with the trend to use wider, flatter-bend handlebars. Max starts selling Max/Haro Pro Plate-style number plates for $10.95. Pro Neck Cam (flat) and Saber (flat but folded to create aerodynamic profile) plates advertised. BMXA-branded plates available in all Haro Pro Plate color combos for $9.95. Neal Enterprises offers Werks Oval stickers and Pro Line numbers. No Haro ad in BMXA. 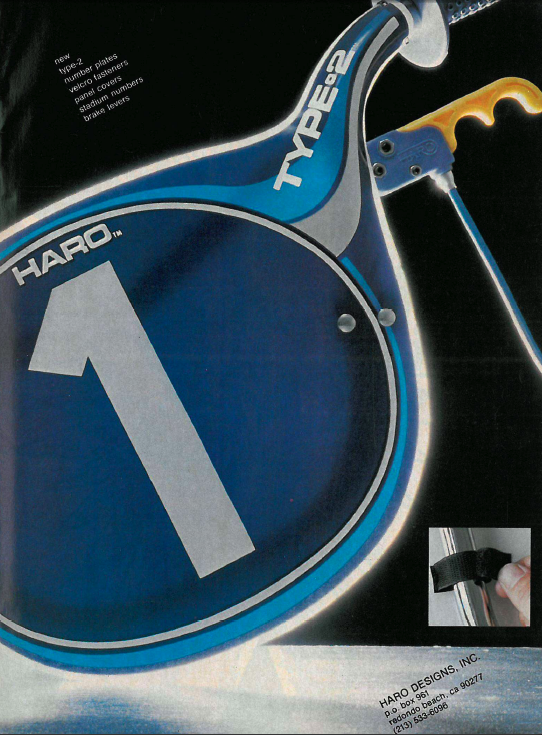 November 1981: Haro runs full-color, full-page ad for Type 2 plate and Haro Handle in Super BMX magazine. Vera’s unveils number plates. January 1983: Haro advertises colored Series One and Color plates and Stadium numbers in Bicycle Motocross Action magazine. Haro Flow Panel Plates also appear in magazines. These are no longer made from LDPE, but rather injection molded plastic. Aero, JT and others introduce number plates with “open” faces for better air flow-through. April 1983: BMXA closes out BMXA-branded Neal plates at the discount price of $8.95. They are no longer advertised by June. May 1983: Steve Veltman pictured in Bicycle Motocross Action magazine with a black and silver Hutch plate. Robinson ad shows Haro Series One Mini plates. 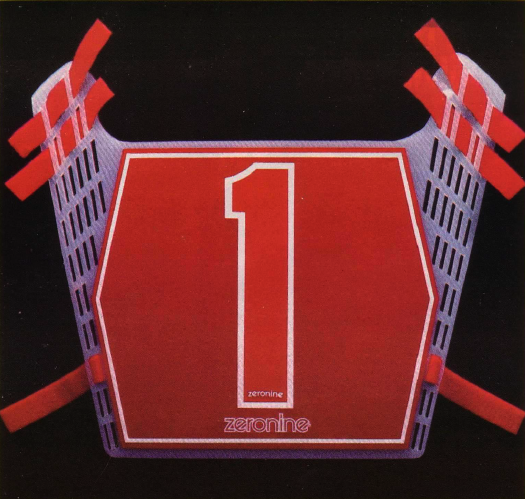 Summer 1983: Haro introduces injection-molded Tech Plate and injection-molded plastic numbers. *All info was gathered from a variety of BMX publications between 1978 and 1983, though the collection of magazine was in no way comprehensive. Introduction dates are based on the cover dates of the magazines, which may have been three to four (maybe more) months behind the date of actual introduction. Info is regarding U.S.-based number plate market only.